AnnoSys, a web-based annotation system developed at the Botanical Garden and Botanical Museum Berlin, is now integrated into the portal of the Global Biodiversity Information Facility GBIF (Fig. 1). 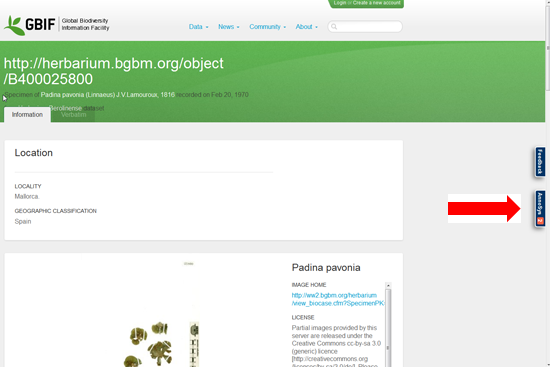 Currently about 119 Mio GBIF specimen data can thus be annotated online (http://www.gbif.org/occurrence/search?basis_of_record=PRESERVED_SPECIMEN), so that corrections or supplements that improve data quality are documented, saved and made sustainably available,. AnnoSys allows users (among others) to annotate identifications, scientific names, or gathering data of a record (Fig. 2. ), similar to the traditional annotation procedure of physical records in natural history collections using annotation labels. In contrast to this, however, annotations are made publicly accessible via the GBIF-portal (Fig. 1, red arrow) and are searchable using specific selectable filter criteria (taxonomic group, collector´s number, country etc.) (Fig. 3). 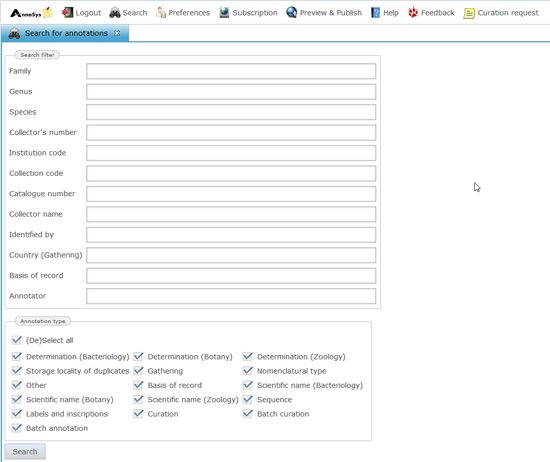 Further, users can make subscriptions to be informed about annotations of specific records, even if these annotations were created in a different data portal (e.g. the German Virtual Herbarium). Using the special curator-interface, curators are able to accept or reject annotations concerning records from their collection, and to make this decision visible to the public. Annotations are very important for the improvement of biodiversity data quality: By confirming or correcting for example the taxonomic identity or the georeferencing of a specimen or referring to literature, they increase the scientific value of the data and their underlying specimens and ensure the communication of new scientific results. AnnoSys is developed in the AnnoSys-project (https://annosys.bgbm.fu-berlin.de), funded by the DFG. It is a repository for annotations and annotatable records with back-end server functionalities, web-services and a user-interface for complex, online available biodiversity data. Currently, AnnoSys allows annotations of biodiversity data in the ABCD and DarwinCore standard. For the annotation data itself the standard developed by the W3C Open Annotation Community Group is used. Within the current, second project phase of AnnoSys, however, further data formats and –standards will be supported to take further advantage of AnnoSys´ cross-domain and cross-standard application potential. Fig 1: Integration of AnnoSys into the GBIF-portal: the red arrow points to the AnnoSys-button, which is located directly beneath the GBIF-Feedback-button. The white number on the red background on the button indicates the number of existing annotations to the record. Abb. 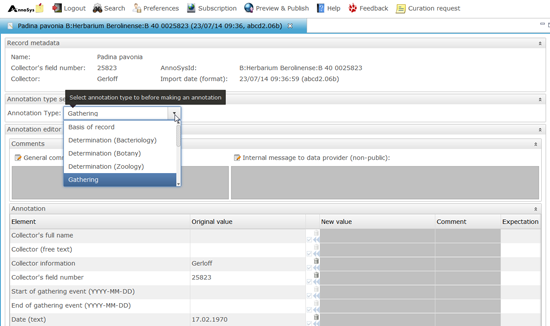 3: AnnoSys-search function (english version available).